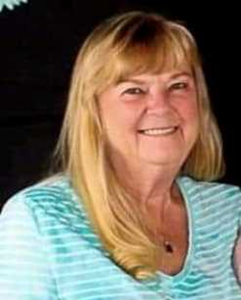 Cynthia A Farr, age 63 of Apopka, Florida passed away on Tuesday, April 10, 2019. Cindy was born to James Arnel Hutcherson and Flossie Ann in Denton, TX on August 8, 1955. Cindy spent most of her early years in Texas, but as a part of a military family, she was able to experience life in other states including Alabama, Hawaii, and Colorado. While in Texas, Cindy pursued a certificate as a day-care manager. She loved kids and worked many years in the daycare industry. After arriving in Florida in 1992, she pursued a certification as a medical transcriptionist. This career choice gave her the opportunity to assist with her growing family.After a long courtship, Cindy married Larry Farr. They spent over 40 years together as man and wife. She enjoyed spending time with family, her cat Tink, reading, baking with the grandkids and going to the beach. Her sweet nature and laughter brought smiles to all who met her. She is survived by her husband Larry Farr; son Wayne Boyle; son Justin Farr and his wife Megan, and grandchildren Zoe and Caleb; daughter Trisha Stack and her husband James, and grandchildren Amie, Jimmy, Zachary, Alysia, Abigail, Ashley, and Liam; her mother Ruth Hutcherson of Farmers Branch, Texas; and many other loved ones. The family asks that donations be made to The Wounded Warrior Project in Cindy’s honor. Add your memories to the guest book of Cynthia Farr. It was a blessing to have known Cindy. I have such wonderful memories of growing up close to my cousins, with my dear Aunt Cindy showing me nothing but love and patience. She was a wonderful aunt to me, and a loving sister to my mother. She will be missed more than she probably ever realized. She never stopped loving! We love you back, Aunt Cindy! Loss of a mother is terrible especially at such a young age. Our thoughts are with you, Megan and the rest of the Farr families, Aunt Kathleen and Uncle Warren. I will truly miss our telephone visits dear niece .